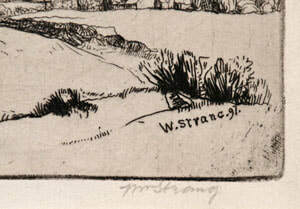 Strang was born at Dumbarton and in 1875, aged 16, he moved to London to study under Alphonse Legros at the Slade School. A prolific artist, Strang was elected a member of the Royal Society of Painter-Etchers in 1891 (where he exhibited over 160 works during the course of his career) and a Royal Academician in 1921. He produced over 750 etchings, drypoints and other prints as well as oils and watercolours.